I found this book to be an immensely interesting read. It was fast paced and mostly kept me interested to find out what happened to Sterling’s brother. But near the end of The Blackbird Papers, I slowly found myself losing interest. Especially near the end when you find out who kills Sterling’s brother and why. What made this murder mystery book so interesting to me was going through the process of uncovering the mystery. You have Sterling’s brother who is missing at first until they discover his body. Then when they find Wilson you see the whole process of them examining his body to find out how he was killed and try to find out why. From there, you see Sterling going through his brother’s research, trying to uncover more clues. I found this part of the story especially to be interesting whenever he uncovered that his brother was trying to discover why an alarming amount of blackbirds were being killed. It made the story that much more interesting because it showed that Ian Smith did a little bit of research to add detail into this book. It also made me want to continue reading The Blackbird Papers to find out who killed Wilson. I also found Sterling as the main character interesting. Especially since this whole case involved the murder of his brother. I thought the story would be a little different since Sterling was trying to uncover the murder of his brother. But if anything, he seemed more determined to find out who killed Wilson than anything else. I know a lot of that had to do with some emotional problems of his own when it came to his brother, and I appreciated that this book included those details within its pages. While you wish Sterling could’ve gotten some reconciliation with his older brother, you also see his character grow as a result of this case. I also like that Smith ended the story by Sterling respecting his brother’s last wishes. I found that to be a very touching scene because he goes through a lot in order to solve his brother’s murder and he is finally able to feel peace that his brother is no longer there. While I enjoyed these aspects of The Blackbird Papers, there was a lot missing from it for me to enjoy the story as much as I wanted to. For starters, while the pacing of the plot started off really wonderful for me, it soon was at a point where it slowed down completely and became predictable. The plot reached this point near the end of the novel when those who didn’t want Wilson’s research to get out tried to frame Sterling for his brother’s murder. Each time Sterling found himself unraveling another piece of the puzzle, he’d have to run away from law enforcement. For me, that started slowing down the storyline because I knew he was close to getting the information he needed. It also felt like Smith added those moments into the story so there’d be action and conflict for Sterling while he’s trying to get to the bottom of the case. I also found the person responsible for the death of Wilson to be predictable. I don’t know if it’s because I already had a feeling whenever his character was introduced that he was responsible or if the plot in the story was just that predictable for me. The only thing surprising about that part of the story was that more people were in on it than I was expecting. But that overall doesn’t really change the way I feel about the suspect because I still had those feelings from the beginning that this person was responsible. The Blackbird Papers is an interesting murder mystery novel. I enjoyed it because the overall story kept me wanting to find out what happened next, but I was also disappointed that the killer was too easy for me to predict. I also found the pacing of the novel close to the conclusion to be lacking, but also really enjoyed the ending because Sterling finally found some peace when it came to his own conflict with his brother. It was overall an enjoyable read that I would’ve liked more if the killer wasn’t so predictable to me and if the ending of the story didn’t move so slow. Wow. I really enjoyed reading this second book in the series more than The Cuckoo’s Calling, which wasn’t at all a bad read, but was missing something The Silkworm had for me: suspense. It was a page-turner, from start to finish because I really wanted to know who killed this writer. I was also curious about the world Strike immersed himself into in order to find the killer and figure out why this person went after Owen Quine. The world of publishing has never been a world I’ve been a part of, though I hope for that to change one day. But I was curious about Quine and this mysterious book he wrote about the people in his life so I was ready to dive in. I’m not going to lie when I say part of my enjoyment of this book is because the case involved an author. I wanted to learn more about his book, and what about it was so terrible that it couldn’t be published. But what I got from that caught me off guard, but also made me laugh at the same time. So I was surprised about the type of books Quine typically wrote, but was also intrigued as to what this revealed about his character. I like that his book was connected to his death. I like that being incorporated into the case because it eliminated a lot of people being responsible for his murder except for the characters we were introduced to. The only problem I had when it came to this case is that Galbraith made Quine seem like the stereotypical author. His character sounded very cocky and arrogant, yet still eccentric at the same time, which is pretty normal to the way I’ve seen authors being described in books. This is a problem for me because people see authors this way already and was hoping his character would be described differently. I also enjoyed seeing Strike and Robin’s friendship continue to blossom. I like seeing the way the two of them work together to investigate because you can tell that they trust each other. But at the same time, I worry that Galbraith is going to try and get them together as a couple. While I wouldn’t necessarily mind that, I really like seeing them work together and just being friends outside of the job. I also like seeing Robin’s character continue to develop as she stands up to her fiancé because she really enjoys her work. I feel like as she continues helping Strike with cases, she comes into her own and is becoming the person she’s meant to be. I also enjoyed this book in the series more than The Cuckoo’s Calling because there was a lot of buildup when it came to finding Quine’s killer. The killer was revealed to us in a surprising way, which made us even more interested in finding out why this person killed Quine. My biggest problem with The Silkworm is the quotes at the beginning of each chapter. I usually don’t mind when books have quotes, but the ones in this book felt like they didn’t belong to me, and I would’ve been fine reading the book without them. I also felt that most of the characters who knew Quine were too similar. I don’t know if it’s because they all worked in publishing or were authors, but it annoyed me because I didn’t really like any of them. They just seemed too similar to me so when the killer was finally revealed, I wasn’t quite as surprised as I thought I’d be. I felt like any one of them could’ve killed Quine, it was just a matter of which one Galbraith decided on. However, neither of these problems for me made me enjoy The Silkworm any less. It was overall a very suspenseful, intriguing read that made me continue turning the page. I can’t wait to continue reading this series to find out what happens next. As a crime scene novel, this book perfectly depicted how investigators solve crimes. There was just enough mystery and suspense to keep me interested in finding out what Ryan and his partner Cassie discovered. The writing was the perfect tone, adding to the suspense when needed, and describing the setting of the world around Ryan in perfect detail. It made me engaged, wanting to know more about what happened. Also enjoyed that the setting took place in Ireland because I haven’t read too many novels that take place in other countries. So it’s always interesting reading books like this where the setting isn’t somewhere I’m familiar with. I also enjoyed hearing more about Ryan’s past. While he’s definitely not my favorite detective in this book, I loved learning more about the trauma he went through and understanding how that shaped him into the character read about in the book. I also enjoyed his friendship with Cassie, my favorite character in the book. I found both of them together as partners to be very amusing when solving crimes because they had amazing chemistry. But while I enjoyed these aspects of In the Woods, there were so many things with this novel too that left me criticizing it. For one, Ryan’s character wasn’t great. When I first started reading this book, I didn’t mind him all that much. But the more I read, the less I liked him. I think my disdain for him is because of the way he acts with Cassie and the way he talks about his past. After everything they’ve been through together and Ryan saying Cassie is his best friend, he lets their friendship go without a fight over the dumbest thing. He ruins his friendship with her instead of trying to talk things out like responsible adults are supposed to do. And she tries to set things right, but he wants nothing more to do with her until it’s too late. That really bothers me because she was his best friend, yet he doesn’t act like it after what happened. I also don’t like the way he talks about his past because he’s never let go of the one mystery surrounding his childhood, the one he has the opportunity of solving only to let it slip through his fingers. I get his memory of events is skewered, but when he’s given the chance to solve the crime that has literally changed his life, he doesn’t put his best effort into it. He starts remembering some of the events that came before, but doesn’t even push himself to figure out what happened. I also don’t like how the main case in this story was solved. There were so many mistakes made during the investigation that it took a lot longer for them to solve the crime if they’d looked in certain places at the very beginning. I also didn’t like who they chose as the scapegoat for the crimes because the person who actually came up with the idea got away with it completely. To be honest, I was completely disappointed by the end of the story. There was so much buildup that I was expecting things to end differently. But that wasn’t the case at all. Instead, things change for the worse and the mysterious crime that occurred during the narrator’s childhood is never solved, despite the flashbacks in the past he experienced. So while I enjoyed reading In the Woods, there were a lot of things in the story that left me disappointed, wanting more than what was given. Nonetheless, I plan on reading the second book in this series The Likeness in hopes that it’ll be a better read. A society wedding at Ely Cathedral in Cambridgeshire becomes a crime scene when a man is murdered. After another body is found, the baffled local constabulary turns to Scotland Yard. Though the second crime had a witness, her description of the killer is so strange it’s unbelievable. When I first started reading this book, I was really excited because the premise sounded very promising. And for the first couple chapters, Hunting Shadows had me hooked. However, this book overall was a big disappointment for me. Normally, I really enjoy reading books like this. I love murder mystery novels. I love these reads because they take a look into the justice system and how the law works. And while these books aren’t an accurate representation of what our system is like, they do paint an interesting picture and give the reader a better understanding of the process investigators have to go through in order to catch the bad guy. They move quickly, leaving no question unasked. But this book just didn’t sit right with me. Having not read the first fifteen books in the series might have something to do with it. However, I think the pace of the novel was another problem I had with it. I just couldn’t get into reading this book because it was too slow. It started off climatic and then dropped the reader down to a slower pace. The reader briefly gets an insight into the killer’s head only to be dropped into the story where they don’t get to see the killer until the last few pages of the novel. And when the killer is introduced, the reader becomes disappointed because he isn’t what the reader expects. Another problem I had with Hunting Shadows was the time period. I know the novel was supposed to take place in the 1920’s, but I really didn’t like the time period in this story or the setting overall. It was just okay. Didn’t add anything to make this book any more interesting for me and want to continue reading. I also didn’t like the main character Rutledge. Not having read the rest of the books in this series might have something to do with it, but I also think part of it is because I just couldn’t connect to his character. For a Scotland Yard inspector, he wasn’t too bright. Some of his actions throughout the novel didn’t make sense to me. For example, the man he suspects to be the killer he takes him along with him while he continues his investigation into these murders only to discover that he actually isn’t the killer. And even after the guy is obviously in the clear, he still suspects him until he is able to find the murder weapon. Rutledge isn’t the inspector I was expecting to be the main character in Hunting Shadows and that really disappointed me and made it harder for me to continue reading this book. However, there are some aspects of Hunting Shadows I did enjoy. The beginning of the story really got me interested in continuing to read this novel, despite how it all turned out. The reader gets to see into the killer’s head as he spots his first victim and sees how he reacts to seeing that character. Another aspect of this book I enjoyed was how descriptive Todd is of the setting. While I didn’t enjoy the time period in this story, Todd definitely knows how to create atmosphere in a novel. The reader sees this throughout the book starting with when Rutledge gets lost to when Rutledge goes to find the murder weapon. 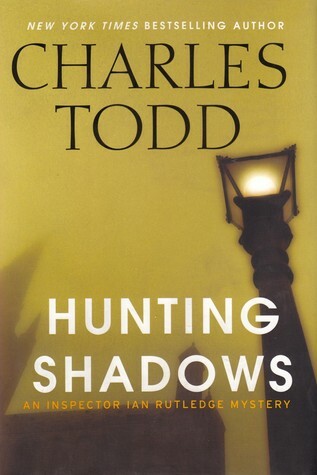 Even though I was overall disappointed in how Hunting Shadows turned out, I still give it three stars because Todd knows how to get the reader hooked at the beginning of a story and can create atmosphere that can mess with the reader’s emotions. This book was an okay read, but not one I’ll be reading again anytime soon.